Celebrate Recovery gathers on Thursday evenings from 6:30 – 8:30 PM at Grand Point Church. Find freedom from your hurts, habits, and hang-ups through a Christ-centered approach to recovery. Check out Celebrate Recovery at our next Thursday evening gathering in room B20, or visit the Event page and make plans to join us for our next cookout! Come to the Regional CR Connection Event on September 22nd! Click the flyer below for more information, or click HERE to register. Celebrate Recovery is a Biblical and balanced 12 step recovery program that helps us overcome our hurts, hang-ups, and habits. It is based on the actual words of Jesus rather than psychological theory. Twenty-five years ago, Saddleback Church launched Celebrate Recovery with 43 people. It was designed as a program to help those struggling with hurts, habits and hang-ups by showing them the loving power of Jesus Christ through a recovery process. Celebrate Recovery has helped more than 17,000 people at Saddleback, attracting over 70% of its members from outside the church. Eighty-five percent of the people who go through the program stay with the church and nearly half serve as church volunteers. Celebrate Recovery is now in over 29,000 churches worldwide! 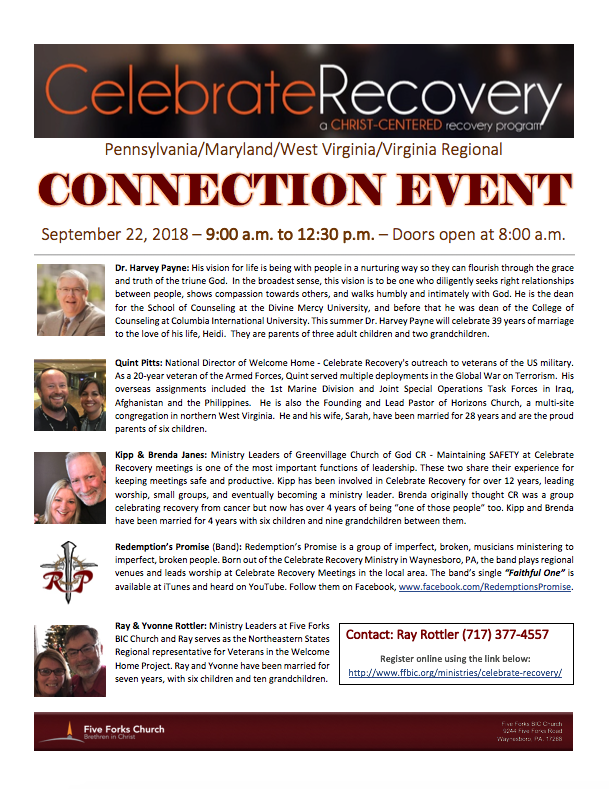 For more information about Celebrate Recovery, visit the CR website: www.celebraterecovery.com. 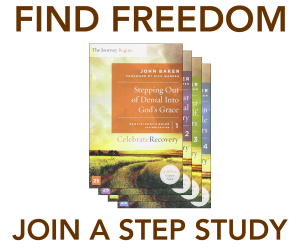 Step Studies at Celebrate Recovery are a great way to help you find freedom from your hurts, habits, and hang-ups. This 6-9 month workshop will walk you through the CR 12 Steps to Freedom through four segments designed to help begin the recovery journey: Stepping out of denial into God's Grace; Taking an honest spiritual inventory; Getting right with God, yourself, and others; and Growing in Christ while helping others. Sign me up for the Men's Step Study! Sign me up for the Women's Step Study! Step Studies will happen on Thursday evenings from 6:30 - 8:30 PM after the CR large group gathering.